Wine and cheese is a classic combination. Whether it takes the form of a lavish spread laid out at a cocktail party, or a simple and elegant course at a dinner party, a wine and cheese pairing is something no guest is ever disappointed to see. But making the perfect wine and cheese match can be intimidating. These five tips break down the process and making finding the perfect wine and cheese combination a snap. 1. The only rule is: there are no rules. Rules and tips can help you, but they can also make you feel paralyzed. That’s why it’s important to keep in mind that the rules are meant to be broken. The most essential thing about choosing a wine and a cheese to pair is to pick something that tastes good to you. Trust your taste buds: if you want to come back for a second bite, your guests will too. Here are some helpful tips for food and wine pairings. You don’t want your wine to overpower your cheese or your cheese to overpower your wine. If one flavor swallows up the other, the balance will be lost. The best way to avoid that is to aim for the intensity of your wine to match that of your cheese. Mild cheese pair better with lighter wines, and pungent cheeses tend to pair better with more robust wines. One good standby technique is to pair wines and cheeses from the same region. Similar soils and growing conditions tend to result in flavor compounds that are the same between the wines and cheeses from a specific region. For example, a smooth Cabernet Sauvignon from the Pacific Northwest region should pair nicely with a local smoked gouda. The saying is true: we eat with our eyes. No matter how beautifully your chosen cheeses and wines work together, your guests just won’t fully appreciate them if you serve them with a flimsy knife for cutting, and crackers that don’t do them justice. Use a wood or marble cheese platter on which to display your cheese, with plenty of cheese knives, and a variety of crackers or a simple french baguette, sliced thinly. It will be impossible to appreciate the full flavors of your wines and cheeses if you serve them at the wrong temperature. White wine should be served at 45-50°F, red wines at 50-65°F. Cheese should always be served at room temperature: bring it out of the fridge an hour before you plan to serve it to take the chill off. Even the most confident of wine lovers can get bogged down by a wine list that reads like a novel. Here’s how to safely navigate a restaurant wine-list and pick a bottle that’s sure to please everyone at the table. Start by choosing between white or red by considering what you’ll be eating. You’re out to dinner, after all: the most important thing is that your wine complements your food. But feel free to throw that old “red wine with red meat, white wine with chicken and fish” adage out the window. A better method is to base your wine decision on your dish’s most prominent flavor. A chicken breast simply poached in white wine, for example, calls for a white wine that won’t overpower the flavor. The same chicken breast topped with a Marsala sauce, with its reduced wine and hearty mushrooms, is bold enough to stand up to a red. Next, consider the heartiness of the dish you’re eating: the dish and the wine should match each other in body or richness. One of the best ways to do this is to consider your sauce. The simple buttery, garlic-y wine sauce in a bowl of linguini with clams plays well with a white wine with some heft, like a California Chardonnay. A pasta primavera with a simpler olive oil-based sauce, however, needs the lighter touch of something like a Cabernet Sauvignon. Here’s where you can get really creative. You can match the flavors and aromas in a wine to ingredients in your dish. A dish spiked with verdant cilantro, for example, can go well with a white wine with herbal, grassy notes. A steak topped with a sauce studded with currants would pair perfectly with a Cabernet rich with berry flavors. The perfect pairing will result in a food and wine match that’s perfectly in balance. Certain components of the food you’re eating can increase or lessen the acidity, sweetness, and bitterness of the wine you choose. Acidic ingredients like citrus juice pair well with acidic wines, making them taste softer and better-balanced. However, if a wine is already balanced, acidic foods can make it fall flat. Likewise, the tannins in a wine interact with the fatty flavors in a dish. Rich foods like steak diminish the appearance of tannins in wine and make it taste smoother. Salty and spicy foods, on the other hand, interact poorly with tannins, and can make a wine taste harsh. With these four steps, you’ll be able to successfully choose a wine to pair with any dish on the table. But as with all things wine, we encourage you not to feel limited. If you don’t like red wine, don’t let that stop you from ordering that porterhouse. After all, what matters most is that you enjoy yourself. Choose a wine you’d drink by itself, and you’ll always be happy. See our recommendations for local San Diego shops that carry the wines we love! There’s no way around it: choosing wine to accompany the Thanksgiving meal is a tough task. First off, you have to choose a wine that goes with a wide variety of dishes: something that can stand up to Aunt Mabel’s marshmallow-topped sweet potato casserole, but that also doesn’t overwhelm the simple flavors of Grandma’s cornbread stuffing. It also has to be a wine that will keep your palate interested throughout the long meal, without making you long for something different after half a glass. Not to mention: it has to be a crowdpleaser. But don’t panic: our experts here at Vintage Cellars have shared their favorite Turkey Day wine picks. And for that, we give thanks. 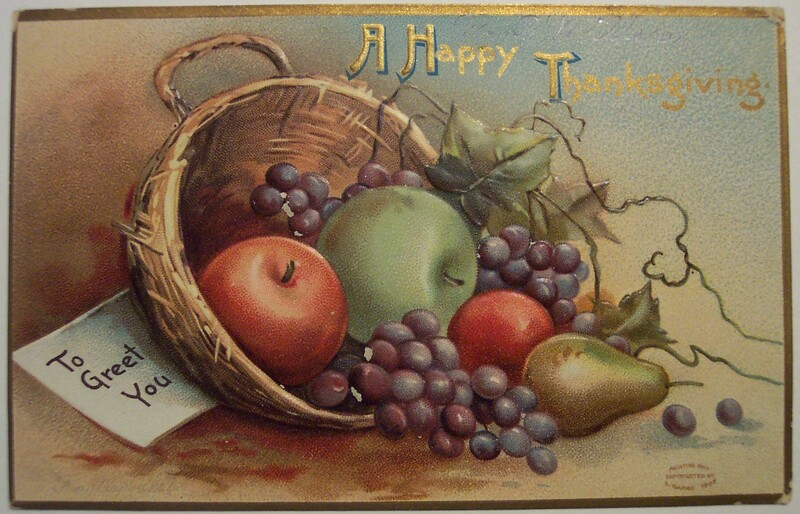 Sparkling wine’s acidity and effervescence cuts through fats (of which there are many on the Thanksgiving menu). This refreshes the palate, keeping your taste buds enlivened through the meal (and even a second helping). You may not want to serve sparkling wines at dinner, but consider starting off your celebration with a glass of wine for everyone. Be sure to choose a Brut (the driest type), and pick something with a clean and light finish. When choosing white wines for Thanksgiving, go for a bright, lively wine rather than a heavy one like a buttery Chardonnay. If you like fruity wines, choose wines with sharper, tarter flavors like pear and apple, or citrus flavors like grapefruit and lemon, rather than luscious, sweet ones like peach and honeydew. Wines with highly mineral notes are great for this meal too: Sauvignon blanc is a crisp and pleasantly non-fruity varietal that will taste great from appetizer to pumpkin pie. It may seem rule-breaking to serve red with turkey breast, but hear us out: the rest of the dishes are so rich that they call for a red to stand up to them. Just don’t go too far: a heavy, rich red can overpower the meal. Instead, choose something with bright fruitiness. Pinot noir is a great choice for Thanksgiving: look for younger wines (which will be bright rather than smokey), with flavors like strawberry or raspberry. Beaujolais is another winner: light, dry and fresh. Slightly chilled is the proper way to serve it, and also helps further helps enliven those butter-laden mashed potatoes. Of course, one of the most wonderful things about wine is that you can (and should) drink what you like. If our advice to choose something light and lively rather than heavy and intense sounds, well, boring, trust your gut. If a super-buttery chardonnay or a dark, fruity Cabernet is going to make your guests swoon, then choose that wine to stock your table. After all, Thanksgiving is nothing if not a day of indulgence. Our very own Jake Austad, master of custom cellar designs, is an expert at touring wine country, and wants to share his tips and tricks. Jake has insider advice on the best vineyards to visit, the best places to eat, and tourist traps to avoid. So pull up a chair, pour yourself a glass of your favorite vino, and hear how an expert does wine country. Check back, because Jake will be blogging regularly in our new “Jake’s Corner” posts. I would start the morning up north in Calistoga at Chateau Montelena, known almost more for its historical value than for its wines. The winemakers at Chateau Montelena are part of the group that started the Napa Valley wine boom. Tthe first thing I’d do would be to make a noon reservation at Duckhorn (reservations are required). Reserve the estate tasting and tour for a great experience. To learn something a little extra, do the food and wine pairing. If you managed to resist the food at Duckhorn, I would travel into St. Helena for a late lunch at Brassica (Now called Cindy Pawlcyn’s Wood Grill and Wine Bar). It’s a Mediterranean place that has received rave reviews, and is a personal favorite of mine to boot. At this point in time, you probably only have time for one more tasting. I would finish at Hall in St. Helena. Since Hall has no appointment needed and stays open until 5:30 PM, you won’t be tied to a tight schedule. One of Hall’s new releases, a cab, was in the top 10 wines of 2011. Since I’m a huge Iron Chef geek, I would eat dinner that night at Morimoto. It’s also in the revitalized river walk area in Napa, so if you’re looking to take a stroll before or after your meal, it’s a great place to do so. Insider tip: Don’t fall victim to the lure of the Napa Valley Wine Train. This tourist trap has three main pitfalls: 1. Trains are really not that romantic. 2. Unless they have improved the menu dramatically since 2000, the food is awful. 3. The wine list is not that impressive, and what is impressive is so marked up that you can’t bring yourself to drink it. I would head up the Silverado Trail, especially if it’s a Saturday. The less inexperienced wine tasters will be driving up the 29, so this is a nice way to avoid them. Start the day with a 10AM appointment at Quintessa. It’s a property and vineyard tour, along with the wine caves and a tasting of three or four vintages. Like Duckhorn, it’s appointment-only, so you have to make a reservation in advance. I know the wine are fabulous. It’s also one of the few places in Napa that does estate-grown only. Quintessa is a Bordeaux-style blend that makes only one blended wine every year, so the vintage tasting will be unique. After that, start heading back to Napa again, and hit Mumm just to clean the palate with some bubbly. It should be time to grab lunch, so I would cut over on Rutherford Road and hit Rutherford Grill for lunch. I love Rutherford Grill, and never miss an opportunity to go. There is a decision to make at this point. Option 1: One more tour at Chappellet, a unique experience that puts you up in the hills, and has some pretty good wine to boot. After a 90-minute tour and tasting, you should have enough time to hit Miner. If you are “toured out,” do Option 2: hit Miner on the way back towards Napa on the Silverado Trial. Most likely, you’ll make a quick visit, since you don’t want to miss your 2:30 tour reservation at Staggs Leap. Again, I’m a sucker for history, and Staggs Leap is another historic winery that started it all and has been around for over 100 years. After Staggs, your last stop will be Darioush. This winery doesn’t close until 5PM, and if you have anything left on the palate, they do some great cabs that are always cracking the top 100 wines of the year in the Wine Spectator. Take a nap after before hitting the French Laundry for dinner. If super-rich French food is to much to stomach, try Coles Chop House or the Napa Valley Grill. At this point, I’d pack the bags and drive over the mountain to Healdsburg and the Dry Creek Valley. Make a reservation at Charlie Palmer’s place, Hotel Healdsburg. Start at Zichichi and then drive south down West Dry Creek Road (eventually turning into Westside Rd). It’s a small, twisty, windy road but a offers a unique change from the large-cellar, big tour, big tasting rooms in Napa with little cottages and family-owned wineries. I’d go all the way down to Porter Creek Winery a few miles down. You taste their wines in a little cottage, and often, the winemaker is the guy pouring the wines. Porter Creek is also a fully organic place, tends to bottle a lot of grapes that are normally blended (like cab franc). From there, start making the venture back towards Healdsburg. Another great stops on the way is Williams Seleym (always a top 100 producer). It’s not a bad idea at this time to go park back at the hotel and walk around the square in Healdsburg. There is Stephen & Walker, which has a fabulous port, and several other places to check out. And if you need to switch to beer, there is a brewing company in the square. This way, you can take a day without reservations or a schedule, and just do whatever you want, from a simple sandwich lunch to a pastry at the downtown bakery, to Charlie Palmer’s Dry Creek Kitchen for dinner. Summer is coming to an end. But it doesn’t go quietly: the most sweltering weeks of the year are now upon us. The dark, heavy reds of winter are the last thing on your mind. So what to drink? If you haven’t yet tried Grüner Veltliner, Austria’s dominant white wine varietal, it’s time you did. Grüner Veltliners can vary widely from bottle to bottle, but most are medium-bodied dry wines. Most Grüners are high in acidity, making them refreshingly perfect for hot summer nights. They can vary from fruity, with aromas of apple and pear, to very mineral, to spicy, with notes of pepper. Grüner Veltliner is a great wine to pair food with: its subtle acidity is a good foil for all kinds of dishes. Austrians serve it with everything from Wiener Schnitzel to strong-tasting vegetables such as broccoli and artichoke. Grüner Veltliner also pairs well with spicy foods: try it with your next Thai or Chinese meal. Some Grüner-Veltliners are meant to be enjoyed soon after bottling, but others have the kind of complexity that aging agrees with. If you haven’t tried this varietal before, pick up a few bottles: some to save for a rainy winter day, and some to toast the end of a long, beautiful summer. How Much Alcohol Remains In Cooked Food? We’ve all heard that when you cook with wine, all the alcohol “boils off,” rendering your final dish innocuous. But is the conventional wisdom true? In short, no. It is true that alcohol boils at a much lower temperature than water (173 degrees Fahrenheit, compared with 212 degrees Fahrenheit), but all that means is that the alcohol in a dish will begin to evaporate (“boil off”) before the water does. How much alcohol is left in your finished dish depends on three things: heat, time, and the concentration of alcohol you started with. All three factors have a role in evaporating the booze from your dish. So, for example, a flambéed dessert will end up with more alcohol than will a long-simmered tomato sauce with red wine. The take-home message? It can take up to three hours to simmer almost all the alcohol out of a dish. But don’t worry–there’s still not nearly enough to get anyone tipsy, unless you’re pouring bottles of wine into your food, and eating huge portions. Wine is only about 13% alcohol or so. If you’re adding a cup of your favorite red to a pasta sauce, then simmering it for an hour, your finished dish has only 1.56 teaspoons of alcohol in it. Divide that into four servings, and each dinner guest is imbibing in a mere 0.39 teaspoons–hardly enough to accidentally get them drunk. As for the wine you serve with dinner, that’s another story! Photo credit: Le Grande Farmers’ Market, Flickr. The hottest summer months are upon us. Rather than wishing for fall,why not embrace this time of year with the best produce of the season–and wines to match? Here are some top picks for summer wine pairings. Nothing says summer like sweet, tender ears of corn from the local farmstand. Grill them and coat with salty butter for a classic treat, or grill, then cut the kernels off the cob and toss them with basil, lemon juice, salt, and drizzle of good olive oil for a crunchy, fresh corn salad. The perfect wine to pair with sweet summer corn? A buttery, fruity California chardonnay, of course! Everything about these two is complementary, down to their matching golden-yellow hues. Foodies nationwide wait in eager anticipation of perfect summer tomatoes all year. Eat enough juicy, sweet summer tomatoes with their unmistakable fresh-from-the-garden perfume, and you’ll never go back to their mealy grocery store relatives. The best way to eat perfect summer tomatoes is raw: try them simply sliced, with salt and olive oil, or paired with a good mozzarella, in a caprese salad. Finding a wine to pair with tomatoes is notoriously difficult. You need a wine that won’t overwhelm tomatoes’ delicate sweetness, and that can match their intense acidity. A pinot gris, with its crisp, clean acidity, is a great match. The best kind of peaches are those that are so juicy, you have to eat them over the sink. Sweet, fragrant summer peaches are at their peak for only a few weeks, and we won’t see them again until next summer. They’re great baked into peach pies, but who wants to turn on the oven right now? For a simple summer treat, sprinkle peach halves with brown sugar, then put them facedown on a sheet of foil on the grill. When the sugar starts to caramelize, take them off and fill the middle with vanilla ice cream. Pair with an earthy, floral gewürztraminer and enjoy outside. Ruby-red and insanely sweet, watermelon needs no preparation other than a chill in the refrigerator before eating time. Carve into large wedges and serve with a spoon for easy eating. The sweetness of a great summer watermelon can stand up to a glass of dessert wine, such as port. Drink slowly, admire the sunset, and wish for summer to hang around a little longer. What are your favorite summer wine pairings? While wine purists may roll their eyes at this post, making Sangria has become a popular topic. Taken for what it is, basically a mixture of wine and fruit, Sangria is often a summertime “gateway beverage” that leads non-wine drinkers to eventually explore the richly-rewarding world of wine. (Some folks say wine coolers act in a similar way.) While Sangria tends to be very fruity and sweet, the good news is that you can control its sweetness if you make it yourself. What is more, Sangria pairs well with just about every kind of BBQ sauce, especially sauces rich with honey flavor. This means it’ll be enjoyed at almost any cookout. And, of course, it’s a great addition to Caribbean meals. If your BBQ sauce is too acidic, or if your Sangria needs to be sweeter to combat other big dinner dishes, simply add more sugar as needed. You can even experiment by altering the other ingredients. Have fun! Give this recipe a whirl on one of this year’s final summer days. Without referring to the internet (or your latest wine-pairing app), how can you tell what wines go “best” with what foods? Here’s the simplest wine pairing rule that almost always produces yummy results: if it grows together, it goes together! That’s right. Tried-and-true wine and food pairings often originate in the same region, and because of this synergy many pairings (and wines themselves) have been “perfected” over hundreds of years to best match the local cuisine. For example, goose and duck go great with wines made where they roam abundantly in Catalonia, Spain. Try pairing them with a regional favorite like a bottle of red Vall Llach, Cellers Pasanau, or Clos Mogador. Goat cheese, a common product of France’s Loire Valley, pairs superbly with Gerard Boulay and Henri Bourgeois. (See our blog post on wine and cheese pairings here.) Having bistacca alla fiorentina as an entrée? Pair this classic Italian dish with Italian wine from the same locale: Brunello di Montalcino! When in doubt, pair your dish with a wine produced in the same region. Remember: if it grows together, it goes together. A wine’s label usually presents valuable clues about its origin, so ask to see it if you’re unsure. Your waiter or chef may also have excellent suggestions once you’ve narrowed down the options, so don’t be afraid to ask for recommendations. If you do have a smartphone handy, check yourself with a program like WineStein Pro to see if you’re on track! Cheers to easy pairing! If you enjoy cooking with wine, you probably keep a few bottles on hand. However, “wine emergencies” do happen; dogs and children can knock over portable wine racks, you can drop, break, or spill the last bottle of “perfect” red wine meant for your dinner, or you can be so rushed to get home and start cooking that you forget to pick up that “perfect bottle” in the first place! Although nothing competes with a quality wine, below are a few cooking tricks to use in an emergency when you find yourself without a proper wine. Use a Napa 4-bottle wine dispenser to keep wine on hand while you cook. If you are making a soup, stew, or sauce, do not add the wine alternative at the last minute. Instead, add the substitution to your liquid as it simmers so you can accurately gauge the balance of its flavor and its overall scent. If you need a red wine substitute for soup, consider using 1/2 a cup of broth mixed with 1 teaspoon of red wine vinegar. Don’t have red wine vinegar? Use 1 teaspoon of lemon juice instead! Although these alternatives may sound a bit odd, the results are far superior than if you resort to “cooking wine.” Although you may have an inkling, resist the temptation to use cooking wine! It is often flavored with salt and various additives that will easily compromise your dish. Of course, the best course of action is to always have extra bottles of wine around “just in case.” To ensure you always have a few bottles of red on hand, consider purchasing a Napa 4- bottle wine dispenser. This way, you’ll always have a bottle “on tap” and ready to go. 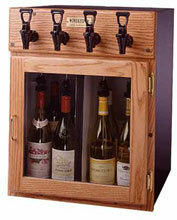 The Napa 4- bottle wine dispenser also fits conveniently in most kitchen spaces. Cheers!